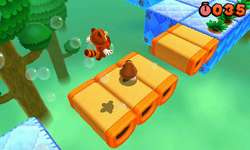 Special 6 is the sixth of the special worlds appearing in Super Mario 3D Land. 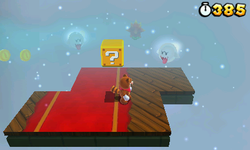 The world takes place in a sky-based area at night, with a grey checkered ground and various sparkles, hills, and clouds in the background. Its theme is a remix of the normal World 6. 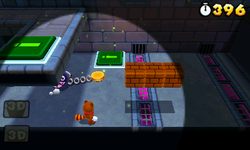 There are six levels and one Toad House. 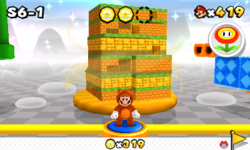 Special 6-1 An equally difficult version of World 3-1 but takes place at night with lots of Propeller Blocks. Special 6-2 A harder version of World 3-3 with the time set to 30 seconds. 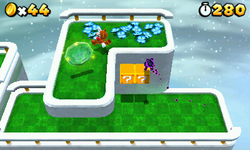 Defeating Goombas awards the player with an additional 10 seconds. 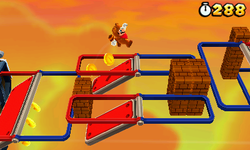 Special 6-3 A harder version of World 2-2. The Flip Panels follow much more complex paths. Special 6-4 A slightly altered World 4-3 featuring a night sky and a Cosmic Clone. Special 6-5 A harder version of World 8-4 with a very dense fog. Many obstacles move faster. 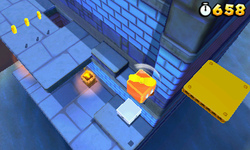 Special 6- A harder version of World 4- Airship with a boss fight against Boom Boom midway through that can be skipped. Requires 200 Star Medals to be unlocked. This page was last edited on June 23, 2018, at 00:28.